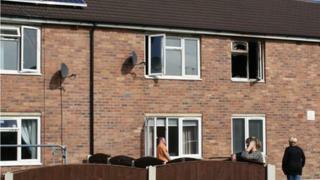 Three people have been rescued from a flat fire in Wrexham which is being treated as suspicious. They were trapped in a first floor apartment during the blaze at Y Wern flats on the Caia Park Estate on Friday shortly after midnight. North Wales Police say one man was taken to hospital in the incident which is being investigated by fire and crime scene investigators. Other residents of the flats were evacuated as a precaution. More than a dozen firefighters attended and used ladders and hand tools to break into the flat as three engines were sent to the scene. Police said house-to-house inquiries are also under way in the area. Officers are appealing to witnesses or anyone who has information regarding the incident to contact DC 2498 Bowyer Jones or DC 1101 Williams at Wrexham CID on 101 or Crimestoppers on 0800 555 111.